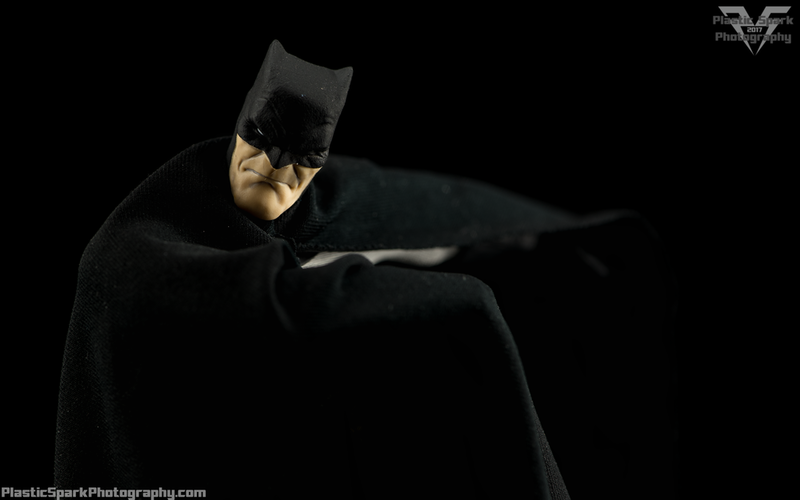 Batman was, to my knowledge, Mezco Toyz first major showing in their high end 1/12 scale collectors line, the One:12 Collective. I hadn’t been following the company at the time and didn’t really know about the figure prior to release but after hearing everyone’s glowing recommendations I knew I wanted to add this representation of The Dark Knight to my collection. Fast forward to Christmas morning and he’s sitting under my tree with a bow thanks to my lovely girlfriend. Guess she picked up that I wanted to get one after I wouldn’t stop talking about it! 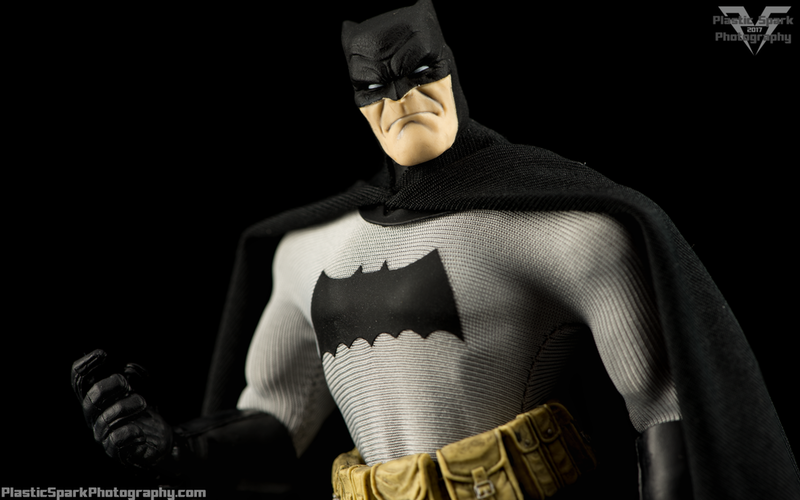 This is the black and grey, retail release version of Batman. There are 4 other versions, a grey and dark blue version exclusive to Mezco Direct, a Blue and Grey version with the yellow bat symbol which I believe was a previews exclusive, and a black and white convention exclusive variant. The figure was also released in a battle damaged 2 pack with the mutant leader. I don’t normally talk about packaging all that much but Mezco really does an incredible job with the packaging for their One:12 Collective series. Batman comes packed in a dark blue box made of heavy cardboard with a brilliant lightning bolt emblazoned on the opening book style cover. On top of all of this is a slip cover with the silhouette of Batman leaping through the sky that lines up perfectly when placed over the box in homage to the original cover artwork for The Dark Knight Returns graphic novel. 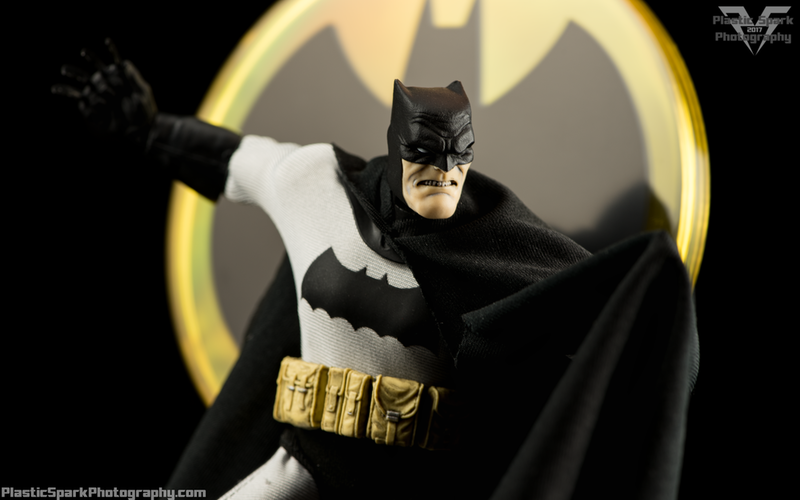 The figure is held in place behind a plastic clamshell, surrounded by his various accessories and with the bat symbol stand on display behind him. This makes for an awesome presentation that draws you in. 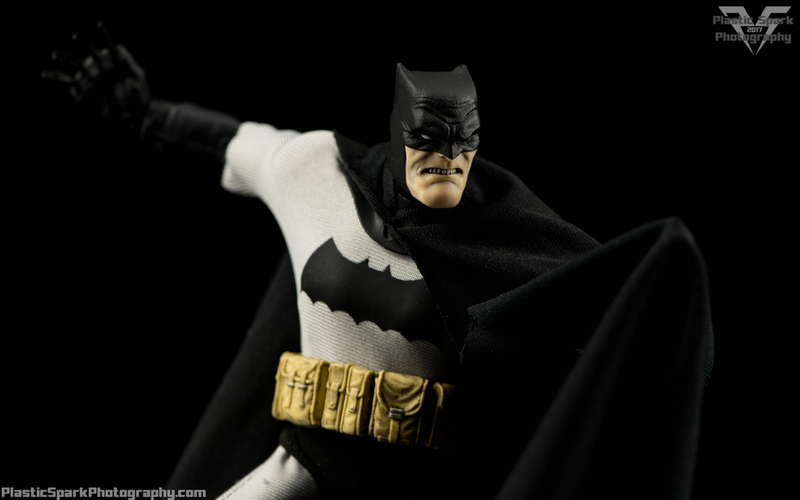 Once Batman is removed from his plastic prison the first thing that hits you is the feeling of fabric and plastic working in unison to create a masterwork in toy form. Batman feels heavy and solid, with ratcheted joints and durable, stretchy materials, he feels great to pose and holds positions solidly. I have never handled any Hot Toys, 3A, or similar style figures so working with soft goods and full body costumes over poseable bodies is a new experience for me and I can definitely see the appeal. The hidden joints and textured look of the costume add a level of finish not available with your standard 1:12 scale action figure. Conversely I do find the hidden joints to be a bit overwhelming as it’s hard for me to gauge their exact positions and tolerances, as well as keeping the fabric out of the joints when posing them. I was terrified when I first started posing him and I know from looking online that I could have gotten some more extreme poses out of him but I didn’t want to run the risk of damaging the figure or his costume. Mezco's use of mixed materials, combining various densities of plastics, fabric, and paint make for a multidimensional presentation that feels great in hand and pleases the eye too. Speaking of mixed materials, let’s talk about one of Batman’s most iconic accessories, his cape. In a world where action figure capes are usually the weakest piece of the puzzle, Mezco has absolutely nailed how to pull off a cape at this scale. I don’t collect a lot of Batman figures despite him being one of my absolute favorite comic book characters of all time, mostly because the majority of figures have either hard plastic/flexible rubber capes that limit movement and articulation as well as realistic postures or, they have light fabric capes that look like black Kleenex floating in zero-g. Mezco has used a medium weight, stretchable material with vinyl strips adhered to the lower tips of the cap to add weight. This allows the cape to rest very naturally on Batman’s shoulders, and to sit comfortably when draped over his arm, or when fanned out on the ground if Batman is in a kneeling pose. It also allows the sharp tips of Batman's cape to remain sharp instead of curling up like so many cheap fabric capes have in the past. I have nothing but love for this cape and I have to commend Mezco on fixing what has easily been my most frustrating issue with super hero action figures. I straight up wish Mezco would sell capes like this for all my other super hero figures. Mezco One:12 Collective Batman includes a number of accessories to allow for the recreation of key scenes from The Dark Knight Returns. First and foremost is an alternate head sculpt; a gritty, teeth-bared expression of determination. 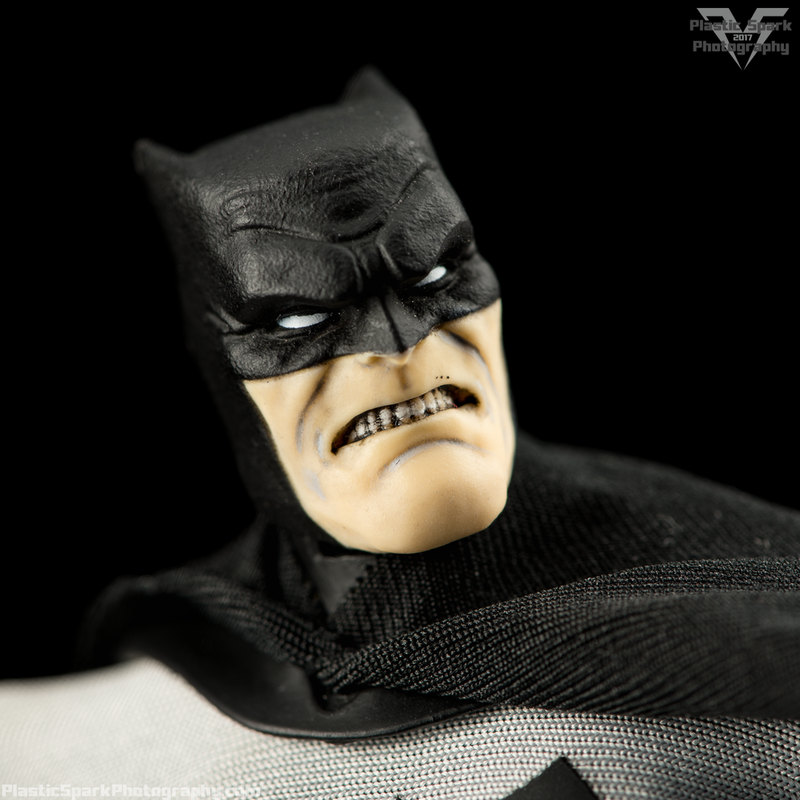 There is a nice black wash that brings out the details in Batman’s jaw and teeth although it does also give him the look of a seafaring pirate with dirty teeth. The head pops off of a ball joint at the neck very easily without any concern. There are also 6 replacement hands for a total of 8 hand options. The hands are identical on the left and right, and include fists -by default these are the hands attached in the box, spread finger hands that work for a slightly awkward but believable relaxed pose, and especially well for flight poses or having batman grab at things, trigger finger hands which also work as a sort of relaxed hand, and clenched fists with Batarangs in between each finger. The hands slide off of a friction peg at the wrist and are very easy to replace without harming the figure. There is an included grappling hook with a length of rope/thread. The thread does a good job of simulating rope at this size however it does have a tendency to fray ever so slightly adding a bit of a fuzzy look to the accessory, kind of like a wool sweater when it starts to shed. The claw end is very thin and I would advise caution when posing with this accessory. It doesn’t feel poorly built at all but the size does cause me some concern. I wish there was some sort of hook or clip to add this to his utility belt but it’s a decent accessory none the less. Batman’s final accessories are a replacement left boot with a pistol holster, and the pistol intended to be holstered. The boot swaps off at the leg but I honestly didn’t feel comfortable doing this with my copy as I have heard horror stories about the costume fabric on the leg coming undone and I didn’t want to risk this. To be fair I don’t know if this is a widespread issue or maybe just the experience of one person online but the pistol is a redundant accessory for me in the first place and I have no intentions of displaying Batman with the firearm holstered or otherwise. It is a very nice addition referencing a key moment in the comic book. The pistol itself is molded nicely and looks fairly accurate to the dart pistol used in the comic book. 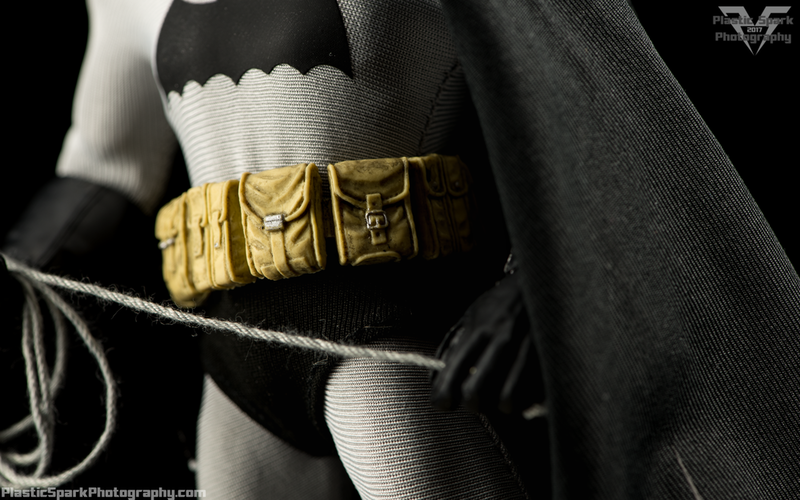 It has the same black wash applied as the pouches on Batman’s belt which helps to add a sense of realism and age to the accessory. There is also an included Mezco One:12 branded plastic bag very similar to the type that come with Figma, to hold all the accessories. Mezco included a 3 piece display stand for Batman. The first portion is a large plastic base emblazoned with a black and yellow bat insignia. It looks fantastic and I even found a use for it as a backdrop in a couple of my shots. The base has a peg on it for Batman’s boot to peg in and you can use it like a traditional display base. The peg can also be removed to allow the included articulated arm and claw to be mounted in the base. This stand is very similar in form and functionality to your standard Tamashii articulated stand but upsized to accommodate the size and weight of the Mezco Batman figure. Mine was a little loose out of the box but a quick tighten of the center screw fixed that up easily. There is a third portion to the stand that clips on to the claw portion of the articulated arm. 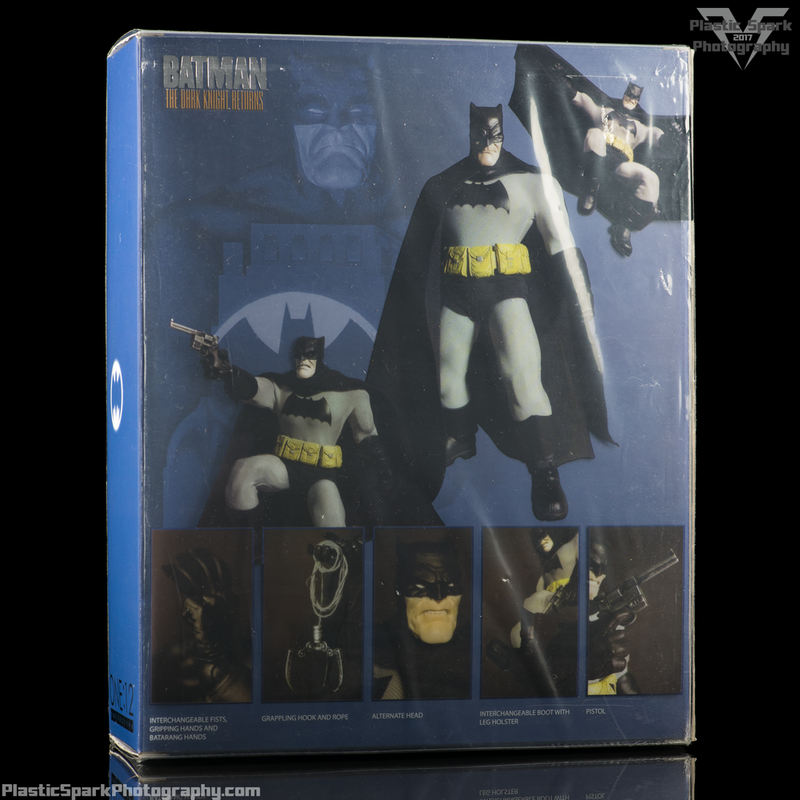 This piece has 4 adjustable wires with slide on clips at the end to hold Batman’s cape in various shapes for flying, gliding, attacking or just general airborne action poses. This is a cool alternative to running wire through the cape and allows for a very dynamic display once you figure out how to use it. 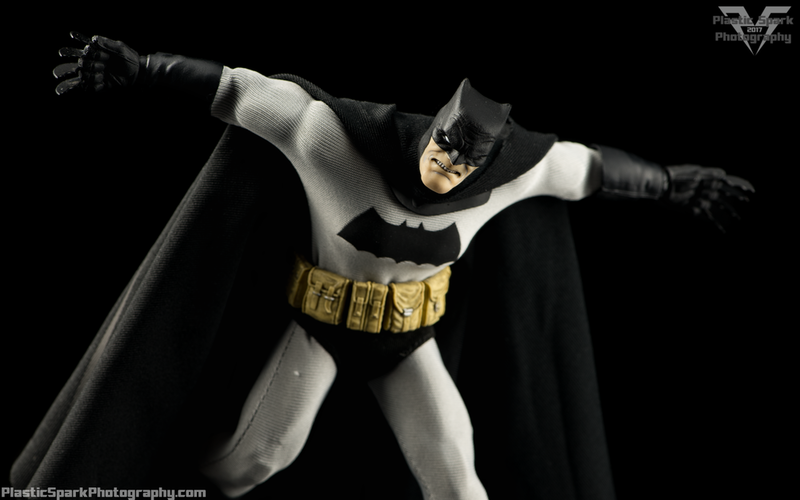 It’s got a bit of a learning curve but after a few minutes I was able to get my Batman posed in a fairly fun flying kick/tackle pose with the cape outstretched. At the end of the day I am very impressed with this Batman figure, especially for the first figure released in this new line. Batman is at least a year old at this point and since then the One:12 line has exploded with tons of figures from DC, Marvel, Star Trek and other franchises all of which look very cool. I personally also own the Previews version of Judge Dredd from this line who is another very fun toy and I will be putting up a gallery and review for him soon as well. I really want to try and track down the navy blue and black variant of Batman and I’m looking at the Joker and Punisher DX figures they have in the pipeline as well. I would like to note that while this line is branded as 1/12 scale, Batman does seem every so slightly larger standing at well over 6 inches tall and may have some trouble interacting with other figures in this scale. I don't personally find this to be a deal breaker given the source material he is based on where Batman is presented as a gigantic slab of meat in spandex but it is something to be aware of. "I don't want to protect him, I want you to hurt him... He's used me for the last time." "You can't protect The Joker from me this time Harley... He's gone too far. Tell me where he is!" I think there could have been a few more included accessories; a loose Batarang or two would have been nice as well as the modified sniper rifle/line launcher that is included with the other variants. While I understand from a marketing perspective the reason for including different accessories with different variants I would have preferred they each had the full accessory set. At the end of the day Mezco has struck a chord with me as a primarily 1/12 collector who doesn’t have the room for Hot Toys style figures but craves a similar quality and attention to detail. I hope we continue to see this line flourish and if future releases are on par with Batman I have no hesitation recommending them. If you’re a fan of The Dark Knight and would like a poseable representation of the aged crusader for your collection I absolutely recommend this figure. Had I received him sooner than Christmas I likely would have found him a spot in my 2016 top 10, he’s that awesome! Check out the full gallery down below! This figure was a lot of fun to photograph. I'd love to hear your thoughts on this rendition of everyone's favorite caped crusader! Let me know down below or on the Facebook page if you prefer!